Yay! It’s time for another Countdown to Gogol Bordello! Earlier this week I followed through with a verbal commitment to my brother and bought my ticket to Gogol Bordello! So on June 19th, I’ll be meeting my brother, my brother’s girlfriend and my brother-in-law‘s cousin’s ex-boyfriend for the Richmond, Virginia show at Toad’s Place (anyone else out there going??? Aaron? You know you want to!). To share my excitement, here is a quick video I took with my camera at the 10/18/2008 show in Blacksburg, Virginia. Yeah, so what if the resolution and the sound aren’t that great? You get to see the energy of the band and how eclectic they are! In this video, you’ll see drums, an accordion, cymbals, a guitar, a violin and the lead singer playing a plastic bucket. Yup, a plastic bucket. How is that for diversity? If you want better pictures of the band, once again I recommend Aaron Evan’s set from the October 16, 2007 show in Baltimore, Maryland. As long as my brother doesn’t lose his shoe and his car keys like he did at the New York City show, I think a good time will be had by all! 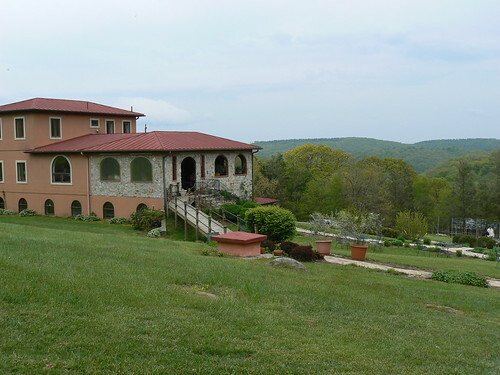 A couple of years ago, my friend Meredith took me to a wine tasting at Villa Appalachia off the Blue Ridge Parkway. 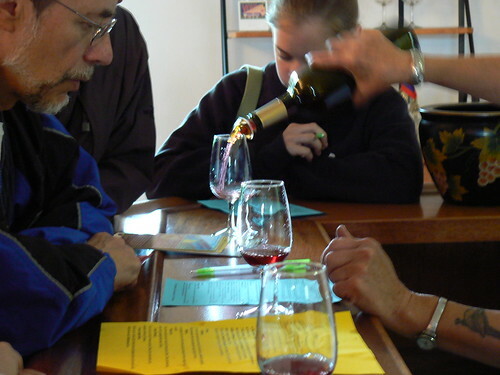 We enjoyed our wine sampling and then moved upstairs for lunch. While we waited for our food, we snacked on bread and some nearby olive oil. It was the BEST olive oil I’ve ever had in my life. It was easily the highlight of my day– Better than all the wines combined! 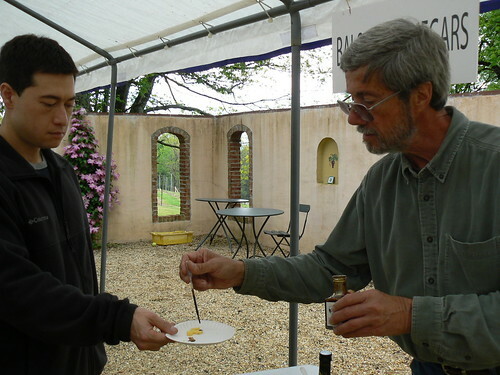 It turns the olive oil was freshly pressed, using olives from the owners’ property in Italy. 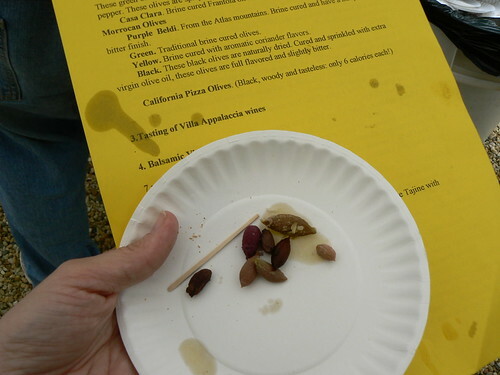 So earlier this year when I saw an advertisement for the “All Things Olive Festival” at the same winery, featuring olives and olive oils from various regions, I was committed from the start. In fact, I made sure to work both Trail Days and All Things Olive into one weekend. 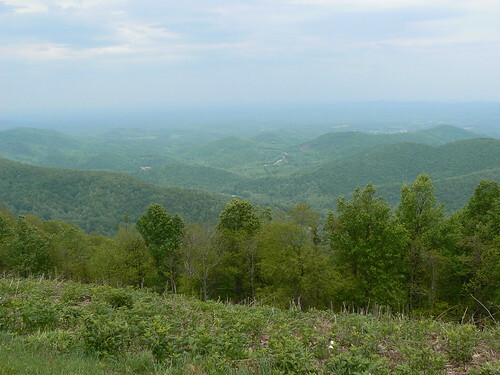 So the Sunday after Trail Days, Sean, Lud and I headed down the beautiful Blue Ridge Parkway. 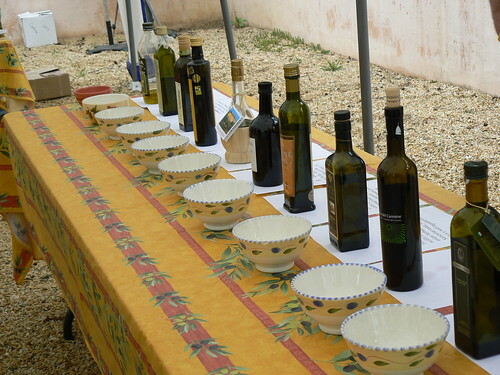 We enjoyed a series of tastings – olive oils, olives, balsamic vinegars (including one that was 25 years old) and wines. We got to enjoy the beautiful scenery and finally, we had a nice lunch provided by the folks at Zeppoli’s. I thought it was a good day and well worth the $15 dollar fee. The aftermath – oil stained sheet and plate full of pits. I actually think they are just about the worst taste in existence (especially the green ones) — out of edible food. Obviously I’m not including feces, rotten milk, and non-edible/non-food. But I have drank egg nog so rotten that it had chewy chunks in it (And then proceeded to finish Carolyn’s) – infinitely more edible than olives. The thought of martinis with olives sickens me. And the only way to make an olive taste even worse? Put a pimento in it! They managed to one-up themselves! 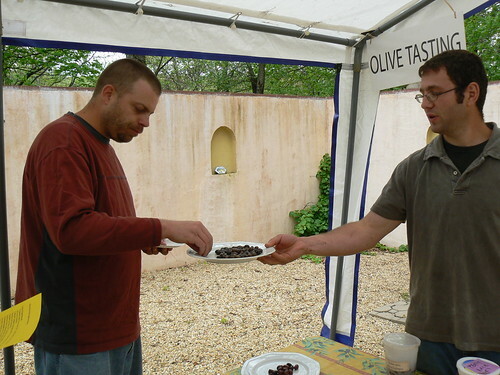 More pictures of the All Things Olive Festival are available on my Flickr site. Saturday was a busy day. I drove up from Blacksburg to the DC area with three dogs, made a quick trip to Safeway and then my Mom and I frantically worked on some Chocolate Chip Cookie Dough Truffles. The truffles were rushed and not quite as pretty looking as usual, but they still retained that oh so delicious taste. Which was good, because they were my dish for a BBQ at Stacy and Louise’s house!!! The BBQ was a mini-wedding party reunion from Stacy and Louise’s wedding last November. On the bride’s side “my” bridesmaid, Jenn, was present. The groom’s side was all accounted for! Best man Kipp was there as well as Groomsman Matt and of course, Groomsman Vicky (that’s me)! My favorite part of the day would have to be around dusk when our whole group went for a walk through a park and an adjacent neighborhood. 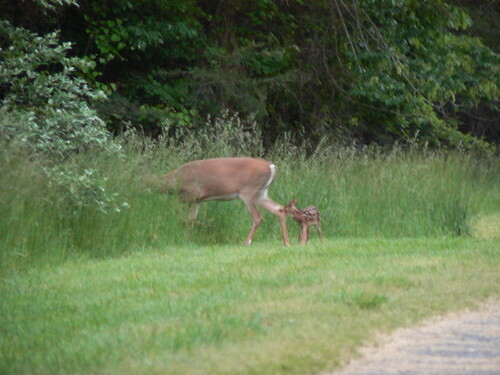 We even ran into a doe with a tiny, tiny, spotted fawn. I didn’t manage to keep my camera still enough for a decent shot. Anyway, some pictures. Most of these are courtesy of Matt. Note that my post-Locks of Love hair is finally long enough for a pony tail again! SWEET! I celebrated by wearing a pony tail every day this holiday weekend. @$(&ing low light at dusk! I definitely enjoyed our reunion and found it to be a very good way to kick off Memorial Day weekend. Perhaps Stacy and Louise could be convinced to make it a tradition. As for more pictures, Matt has a set of party pictures on his Flickr site. I have a small set up as well. Finally, I’m sure eventually Casey will have hers up too. Another personality followed in Richard Preston‘s book, The Wild Trees, was Michael Taylor. Michael Taylor was not a scientist or a climber. He was just a normal man (one afraid of heights at that) who one day decided that the tallest trees in the world were yet to be discovered. 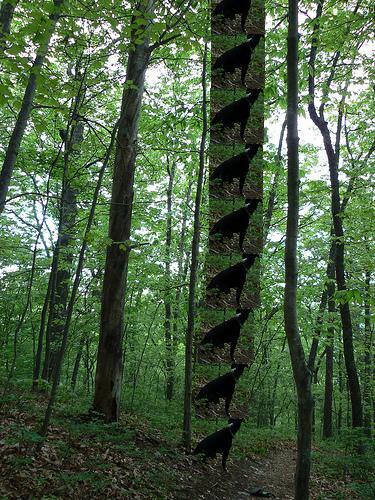 So he went out into the woods and looked for them. When he first started his explorations of northern California, his measurement technique was crude, but cost effective. Taylor made his clinometer out of a plastic protractor […], along with a piece of string, a thumbtack, and a wooden pencil. The device cost him forty-five cents. That’s exactly what researchers did in September 2006 when they measured Hyperion at 379.1 feet and confirmed it was the world’s tallest tree. For the layman, like myself, there are a lot of a different ways to measure the height of trees, some using angles, some using sticks and some simply measuring shadows. Over the years, I’ve half-assed my own technique which makes Michael Taylor’s hand-made clinometer look cutting edge. Make Jimmie stand or sit next to the tree. Now, if I am ever inclined, I can open the picture up and count the number of Jimmies to the top. The tree is at least 8.5 Jimmies tall. Since Jimmie sits at 29″, the tree is roughly 20 1/2 feet tall. Jimmie’s expertises are by no means limited to trees. His services are just as applicable to rocks or tree tumors. 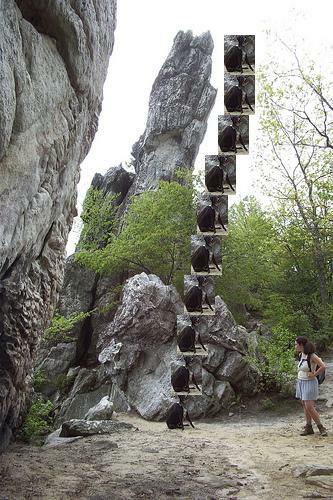 Dragon’s Tooth is a little more than 10 sitting Jimmies high. 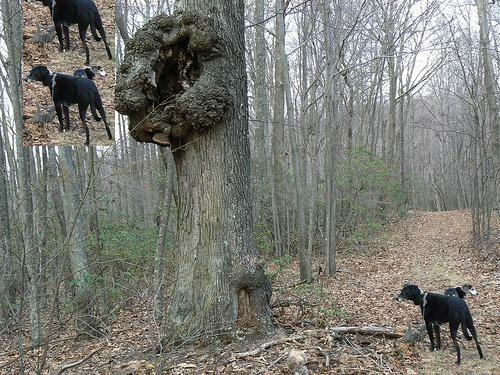 Jimmie, with apprentice Henry, “measuring” a tree tumor. Of course, one day Jimmie will have to retire from hiking. So I suppose I should practice some of those other techniques. My favorite bird really didn’t do much to earn its title. It’s the chickadee and the only reason it was propelled to the top was because it was my maternal grandmother’s favorite bird. 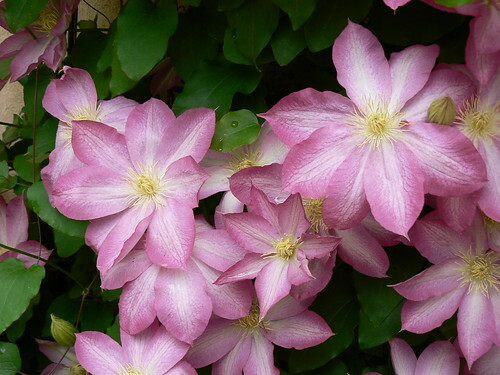 Sure they are cute, but I really did not embrace them until 2000 when my grandmother died. After that, anytime I saw a chickadee I was reminded of her and it made me smile. And from there my love of those little birds with the black caps grew. BUT– my second favorite bird earned its right on its own volition. And, unlike the chickadee, I think it’s a less traditional candidate. It’s the turkey vulture or, as I indiscriminately call them and black vultures, buzzards. I ran into a few yesterday as I drove to Deerfield Bike Path for a walk. 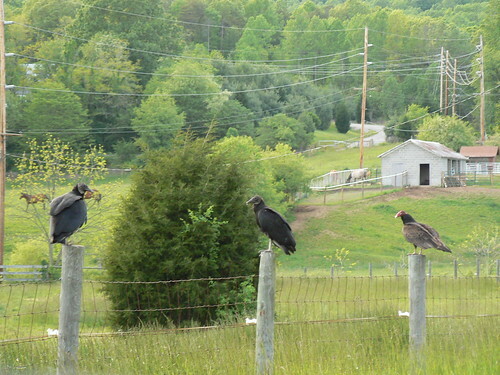 Three “buzzards” just hanging out – the two on the left are actually black vultures and the one on the right is a turkey vulture. I love these birds. A buzzard’s floating silhouette was a near constant fixture in sky when I was a child. They always looked so tranquil. Now whenever I see a buzzard above, I feel closer to my family and closer to home. 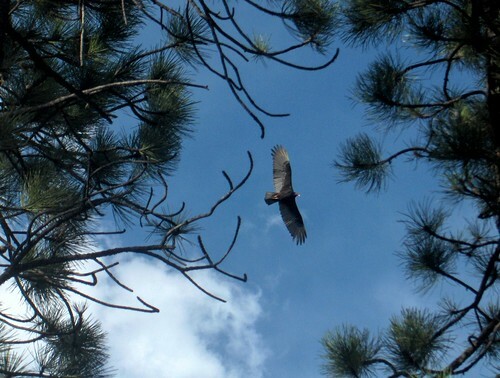 On the subject of childhood, buzzards evoke a memory that still makes me smile. One day my father was especially displeased with my younger brother. I was out in the yard with a gruff Dad, and he noted a group of buzzards circling above us. 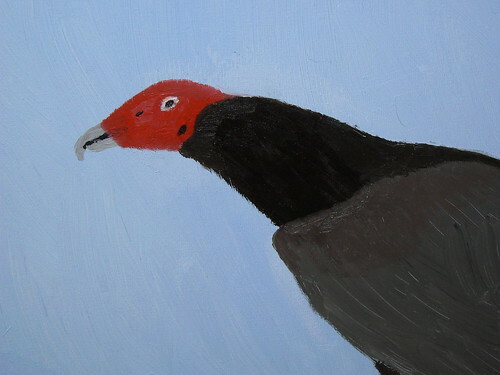 Painting by my brother, who was not in fact devoured by buzzards. Buzzards are also sentimental to me on the emetophobia front. In winter 2002, I was visiting my parents and had a horrible bout of anxiety and appetite loss. One morning my father asked if I wanted to go to breakfast. To me, that was a terrifying request (and not because he suggested McDonald’s). Sounded easy enough. I got in the car and went with my father to McDonald’s. I cautiously ate a few bites of a Yogurt Parfait before my fearful esophagus would swallow no more. He took a few turns and suddenly we were at a townhouse development. Typical to Northern Virginia architecture, all the houses looked exactly the same. But then there was one house in the row that stood out. The roof was COVERED with buzzards… and subsequently had its fair share of buzzard crap as well. 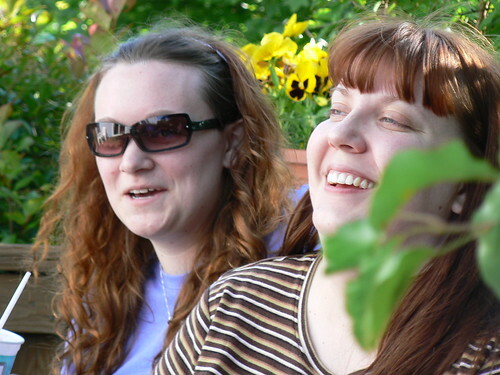 We laughed and pointed and laughed some more. We speculated. What was it about that ONE townhouse that made it such an appealing roost? How come they didn’t sit on any of the adjacent townhouses? Did they used to have a tree in the same spot? Do the owners of the house know they have visitors while they are away? Eventually, we returned back to the car where the yogurt was waiting in the cup holder. I was now relaxed and happy and as we drove back to the house and continued to marvel about buzzards, I finished every bit of my breakfast. The root of my worries that day was a fear of vomit. And here a bird whose defense mechanism is to vomit on its threats was my salvation. 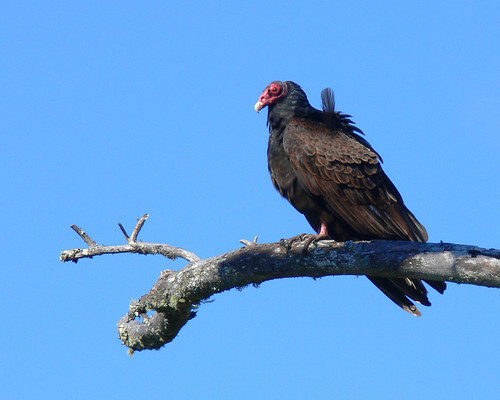 “Turkey vulture” and “buzzard” aren’t exactly appealing terms. The scientific name is a little better– Cathartes aura where cathartes means “purifier”. But I think the Cherokees came up with the best name. They call the birds “Peace Eagles” because buzzards don’t kill to eat. They simply recycle. From my perspective, “Peace Eagle” is the perfect name! When I see a buzzard gliding around in the sky, “peaceful” is definitely a word I would use to describe their flight. Their ability to make me think of my family and feel as if I were home again brings along a sense of ease, a feeling of peace. And one day way back in 2002 when even a meal was a scary notion, it was a group of buzzards who brought me the most important type of peace. Peace from one’s own mind. Now is the time for chestnuts. A stone cast against the trees shakes them down in showers upon one’s head and shoulders. But I cannot excuse myself for using the stone. It is not innocent, it is not just, so to maltreat the tree that feeds us. I am not disturbed by considering that if I thus shorten its life I shall not enjoy its fruit so long, but am prompted to a more innocent course by motives purely of humanity. I sympathize with the tree, yet I heaved a big stone against the trunks like a robber,—not too good to commit murder. I trust that I shall never do it again. These gifts should be accepted, not merely with gentleness, but with a certain humble gratitude. The tree whose fruit we would obtain should not be too rudely shaken even. It is not a time of distress, when a little haste and violence even might be pardoned. It is worse than boorish, it is criminal, to inflict an unnecessary injury on the tree that feeds or shadows us. Old trees are our parents, and our parents’ parents, perchance. If you would learn the secrets of Nature, you must practice more humanity than others. The thought that I was robbing myself by injuring the tree did not occur to me, but I was affected as if I had cast a rock at a sentient being,—with a duller sense than my own, it is true, but yet a distant relation. Behold a man cutting down a tree to come at the fruit! What is the moral of such an act? I wonder how much more extensive his regret would have been, had he known what laid ahead for the American Chestnut? The Director of Land Protection at Mohonk Preserve in New York tested five different blister remedies while she hiked and inspected the preserve. Here are her observations and recommendations.